I always think it’s funny how crazy supermarkets get right before a snowstorm. Everyone is there stocking up on gallons of milk and loaves of bread. Well, milk is one thing, but BREAD shouldn’t be something you need from a store. 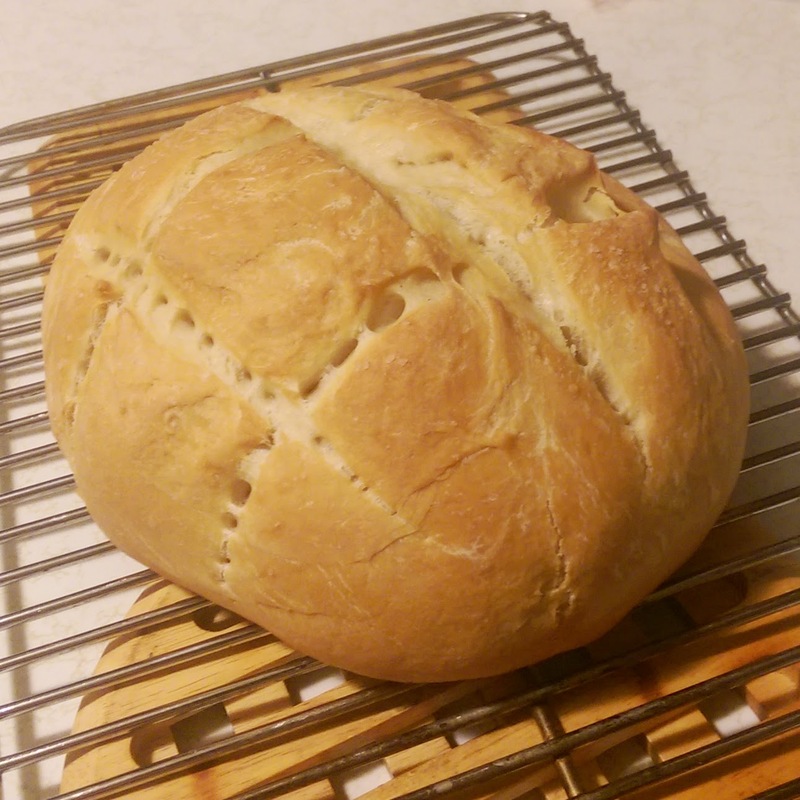 With a foot of snow falling in the DC area last week, I had a lot of time on my hands–which is the perfect time to make your own loaf of bread at home. This recipe is ridiculously easy, and really all you need is half a day to allow the dough to rise. It could be easier still if you had a stand mixer, but even kneading by hand, hands-on time was under 30 minutes. The recipe below is courtesy Michael Ruhlman’s Ruhlman’s Twenty. A great recipe book that goes into detail about the 20 fundamental techniques that can help you master any recipe in the kitchen. Combine flour, water, yeast, and salt in a bowl of a stand mixer, fitted with a dough hook. Mix on medium until dough is smooth an elastic—5-10 minutes. The dough should look smooth, and when you cut a piece off and stretch it, it stretches to a point of transparency instead of tearing. If you don’t have a stand mixer, knead the dough for 20 minutes until you get the same consistency as above. Cover the bowel with plastic wrap and let it rise until it’s double in size–2-4 hours. Move the dough to a work station and knead it to release the gas and redistribute the yeast. Shape it roughly into a ball and cover with a towel—let stand for 10 minutes to allow the gluten to relax. Then, shape the dough into a tight ball-rolling it on the work station between your palms. Coat the bottom of a dutch oven lightly in oil, to prevent the bread from sticking to the pan. Cover with the lid, and let it rise again, for 30-60 minutes (less if it’s hot and humid, more when it’s cold). You can also refrigerate the bread at this point and let it rise overnight–you just need to remove it from the fridge an hour before cooking. When you are ready to bake the bread, preheat the oven to 450 degrees. Lightly rub 1 tablespoon of olive oil over the top of the bread, and sprinkle with salt. Score the break with hash marks, or an X. Cook for 30 minutes with the LID ON. After 30 minutes, remove the lid and reduce the oven to 375. Continue baking until the bread is nicely browned and cooked through–with an internal temperature around 200 degrees. (another 15-20 minutes should do it). Allow the bread to rest of a rack for at least 30 minutes before serving.